In everyone’s story comes a defining moment when life takes a turn. 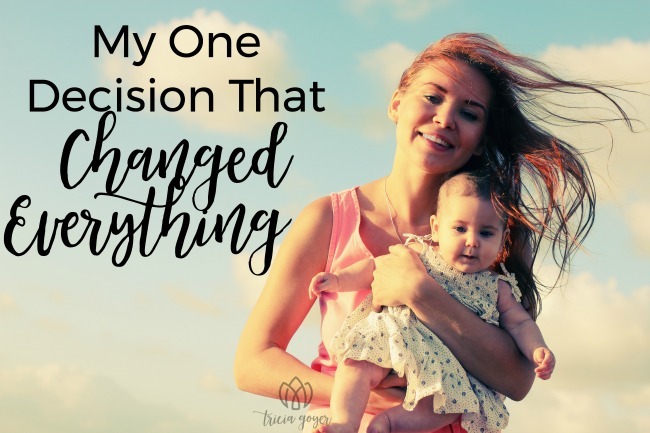 I didn’t see the twist coming, and looking back it almost seems too ordinary an event to be considered “the moment.” But as I ponder all that has happened since then, I have no doubt that everything changed one quiet, early morning in 1999—the morning I said yes to what I knew God was asking me to do. I was twenty-eight years old, married, a mother of three, and had just signed a book contract. In the few years prior, I had attended a Bible study for women who’d had abortions and faced the pain and shame of my past. Now once a week I was teaching a post-abortion Bible study and seeing women from all walks of life find freedom in Christ. Freedom from regret. Freedom from self loathing. Freedom from hiding and the feeling that God could neverforgive them or use them. In this window of my life, I was walking with a new confidence as a beloved daughter of God, my pastor approached me. “Tricia, I feel God asking me to help start a crisis pregnancy center in our town, and knowing your heart and story I want to know if you can help,” he said. Gulp. I told Pastor Daniel I’d pray about it, knowing full well that answer was a delay tactic. I had no intention of doing any such thing. My life was full. I was homeschooling our kids, writing every morning before the rest of the family woke up, and leading a Bible study. My life had reached a wonderful balance of service to mychurch, to my community, and to my family. I couldn’t envision taking on one more thing. Yet, the next morning, as I pulled out my Bible to do my morning devotions, something stirred in my heart. Looking back, I realize the Holy Spirit was reminding me that I actually needed to pray about Pastor Daniel’s request. Immediately a thought entered my mind that I knew wasn’t my own: What about the young women who feel just like you did—scared and uncertain of where to turn? Don’t you remember the women who reached out to share love with you during your darkest time? Where would you be without them? And what are you going to do about the young women who need love and truth right within your own community? How are you going to help them as you were helped? Double gulp. I knew what God was asking me to do. He had a dream and a purpose for me. Both were greater than anything I had ever imagined. And that dream and purpose wasn’t just about what He wanted for me but also about what He wanted for the women in my community. I knew following them would change everything. It came down to this: Did I believe God’s Word enough to do what it said? Did I trust that God would keep His promises? Ephesians 3:16 says, “I pray that from his glorious, unlimited resources he will empower you with inner strength through hisSpirit” (NLT). And that was my prayer too. I had to trust that if I did what God was asking, He would provide from His unlimited resources everything that I needed, starting with inner strength. In the days to come I wished I hadn’t agreed to pray about Pastor Daniel’s request, because it became clear that God wanted me to help start the center. The strength of my desire to follow His directives to seek Him and love others was at .01 percent, but the request was unmistakable. Get your own copy of Walk It Out HERE!